Jennifer Sattler is one of my new favorite illustrators. 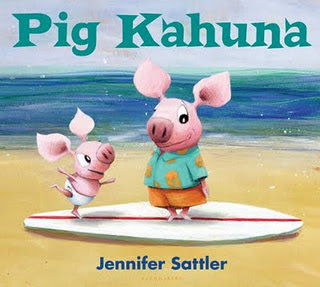 Her recent book, Pig Kahuna (Bloombury Publishing, 2011), is a great example of what excellent picture books can do: interesting and fun illustrations and lively text work together to tell a delightful story of two engaging characters. Fergus and his baby brother Dink are at the beach, collecting treasures. They encounter an abandoned surfboard and play with it, because "[o]f course, surfing on it was out of the question because of the lurking, murky ickiness factor of the water." They decorate and name the surfboard Dave. When Fergus leaves to find some snacks, Dink feels sorry for Dave and sends it out to the ocean. Upon return, Fergus frantically chases the surfboard and inadvertently must face his greatest fear. The expression on his face when the wave rises below Fergus is priceless, and the rest of the story comes to a satisfying end. 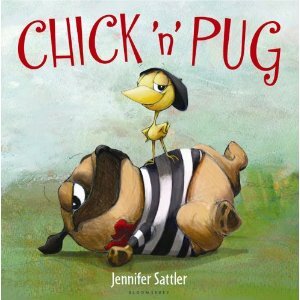 In Chick 'n' Pug (Bloombury Publishing, 2010), Jennifer Sattler wows with a cute story of the unlikely relationship between Chick and Pug. Chick only wants adventure and sets out to find the superhero dog of his dreams, Wonder Pug. He finds Pug, who does his level best to sleep and ignore the perky bird. When a real intruder threatens the peace, it is Chick who helps save the day. 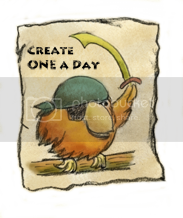 Like Pig Kahuna, the illustrations are very accessible and the characters are full of expression and personality. The textures of the background and the quality of the drawings are super appealing. My girls, who have outgrown most picture books, definitely enjoyed these two books. Hi! Thanks for the lovely comment on my blog!! Your work is also fantastic!! This has quickly become one of my daughter's favorite books. 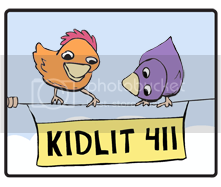 The story is well drawn and Chick and Pug offer great contrasting personalities as most friendships do. Can't wait to read their future adventures.